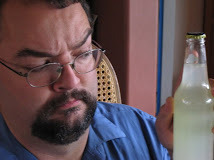 The second soda in today's dual review (following Sweet Corn) is Scotty's Butterscotch Soda. This time it's the one on the right. Well, the soda's left. I mean, the left from the perspective of the soda, not "The Soda Has Left". It does have a left, of course, but there's nothing there. Except that there is something to the left of the soda, if by left I mean your left, and by soda I mean the one on the right. Your right. There's nothing on the right of the soda on the left, if by right I mean its right and by left I mean your left. Right? Now, while we have established (in the Sweet Corn review) that this is probably not Scotsman-flavored; it seems more likely that this is a butterscotch soda, perhaps similar to the other such one we've tried. However, there are a few noteworthy things about this soda's label. First, it features two pictures: a bagpipe-playing kilt-clad man (presumably Scotty, although he is not claiming that "the bottle cannae take much more!") and a stick of butter. Just under the butter is a label, claiming that it is "Pure Cane Sugar". The kilt-clad man, unfortunately, bears no such helpful label. Although I suppose it would probably read "Timing Belt". I sincerely hope that the makers of this beverage do not believe that the pictured substance is, in fact, sugar; if that is the case, this will probably taste nothing at all like I expect. Second, it claims to be "From the King's Castle". Unfortunately, as far as I can tell, Scotland does not have a king at the moment (and according to Wikipedia, what it does have is a "devolved government within a monarchy". Whether the Scots have devolved is a question I'd better not try to address.) They haven't had a king since 1952. So this is old soda. Oh boy. Where and when: Purchased from Rocket Fizz in Vista, CA. Color: Slightly orange, mostly yellow, a tiny bit cloudy. Disturbingly urineish. Scent: Butterscotch, strong vanilla notes, a drone of sugar. Taste: Hmm. Not bad at all. Clearly butterscotch, with a lot of vanilla and caramel, and (to my surprise) a pleasant toasty flavor. Almost like a toasted marshmallow, which goes perfectly with the butter and caramel. Aftertaste is mildly acidic, but not very strongly, and fades relatively quickly. Quite a pleasant surprise. I would happily have more of this. Quaff rating: 3.5. Pretty tasty, surprisingly complex. Love the toasty flavor. Cough rating: 0. Really, nothing to object to. Kibbitzer-in-Chief: "If you drink them together, do you get kettle corn?" I think it could be argued that, for any combination of sodas, if such a question can be asked in a sensible way, you can assume that they're BOTH weird. The Kibbitzer has been suggesting* that I do some more reviews, and as it turns out, I do have a couple of good ones. We'll deal with them in two separate reviews, I think. The first is another from Lester's Fixings, the source of a whole variety of things which should not be soda flavors. Today's is Sweet Corn. This review is about the one on the left. Well, your left. I mean, when you're looking at the picture. If you were in the picture, it'd be on your right. So your left, but only where you are now. Unless you're behind the screen--then it's the one on your right. There's a part of me which thinks that Lester's Fixings is cheating--that they are making sodas like this just to bait me. I mean, who in their right minds thinks that corn** would make a good soda flavor? But then, I think of Hello Kitty Ramune, and realize that unless there is a vast international conspiracy (headquartered in Japan) to make bizarre soda flavors solely to keep blogs like this going, I must conclude that--in fact--Lester's Fixings is crewed by some sort of demented gnomes who (amid chortlings and cacklings and chants) come up with Sodas Which Seem Like A Good Idea At The Time. In which case, I suppose they could be worse. Wasabi Lubricant Soda, for example. Scent: K-i-C: "Oh my God. Is it buttered?" That's remarkable. It smells almost exactly like a freshly opened can of sweet kernel maize***. Which is a smell I like when opening such a can. Here, I'm not so sure. K-i-C (sitting 5 feet away): "It reeks. From here." Taste: Well, there's something you don't taste every day. Okay, let's see...it's sweet. Very sweet. Slightly buttery. And maize-ish. It's not bulgur wheat, or soybean, or even sorghum. This is a reasonably accurate creamed corn flavor. I really have to hand it to the cackling gnomes at Lester's Fixings. They manage accuracy, God help us all. I can't even honestly say I dislike it. Me: "Hey, guys! There's a Weird Soda here for you to try!" I managed to get them to try it. Nazgul: *grimacing in despair* "Oh...no." Olorin: "Actually, I kind of like it. Can I have the rest of this cup?" I see a great future for you, Olorin. How's your cackle? Quaff rating: 3. It's really not bad, and certainly interesting. Bonus points for accuracy. Cough rating: 1.5. It's corn, for the love of all that's holy. * She would like to have some of the space in the kitchen back, I guess. ** Pedantry: Apparently, the term "corn" does not actually necessarily refer to the grain we in the States usually mean. The term can refer to whatever grain is most commonly used as a feed grain in a given region. What we in the states call "corn" is more accurately referred to as "maize". Now, it might be reasonable to assume that by "Sweet Corn", this soda means maize, an assumption supported further by the substantial picture of maize kernels on the label. However, keep in mind the logical consequences of such a supposition; today's other soda features only a picture of a kilt-clad man playing bagpipes, and is labeled "Scotty's". Given the same logic which leads us to believe that this must be a maize-based soda, we are forced to assume that the other soda today is Scotsman-flavored. And that, my friends, is a sanity-shaking possibility I am not prepared to contemplate for even a moment, given that I plan to drink it. I think it's safer for us to assume that this soda might just as easily be barley, wheat, or amaranth-flavored. See how logical and scientific we are here at the Lab? *** Accuracy, my friends. Accuracy above all!